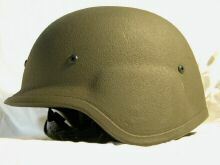 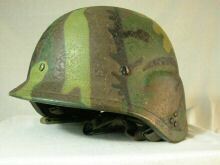 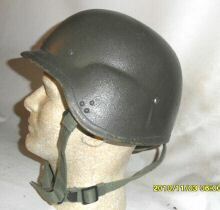 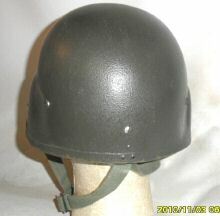 "The steel American style M-1 was the SAF's first helmet. 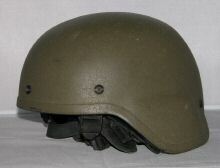 The C-1 was the SAF's first composite helmet and coexisted with the M-1, it was in use at least as early as the first half of the 1990s. 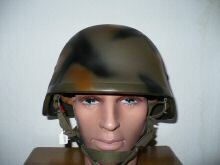 The "PASGT clone" came next. 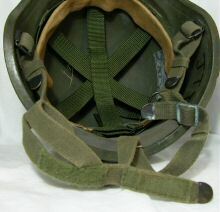 I have handled examples manufactured 1998. 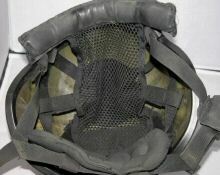 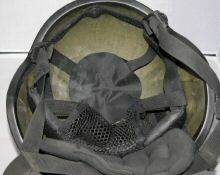 Around 2002 the "PASGT clone" was updated with the nape pad and all the straps you see on the refurbished helmet that captioned "PASGT refurbished and relined by ALL DEFENCE TECHNOLOGY." 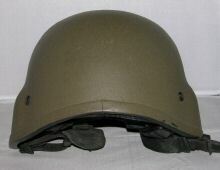 Painted olive drab. 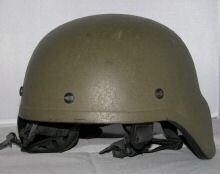 As of 2009, new issue helmets were in the exact style of the refurbished helmet, though may not have been new. 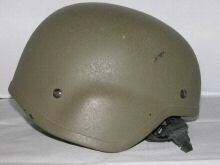 The helmet was now painted tan, you may find olive drab under your example." 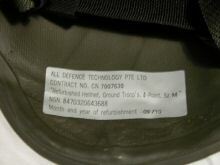 "An All Defence Technology product, being a - and I quote from the label - Refurbished Helmet, Ground Troops. 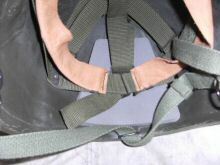 A refurbished version of the ISP PASGT shown immediately above.It appears to have what looks like a virtually identical copy, right down to the apparently useless crown pad, of the liner of the Rabintex 303 Crown (see below). 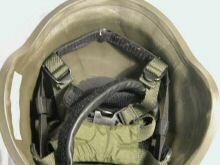 If you look closely - very closely - at the close-up pics of the outside of the shell at side and rear you will just about make out the evidence that the three chinstrap rivet-holes on the PASGT shell have been filled in. 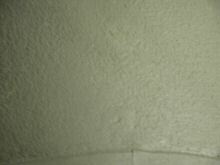 Quite well done, not obviously evident from either inside or outside. 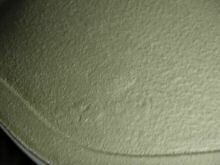 So what's going on here then? 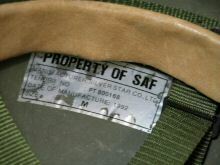 Are these being used by the SAF (this one came with a SAF camo cover), or sold off after upgrading? 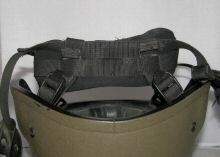 Why is this being done anyway if the SAF is already importing the Rabintex? 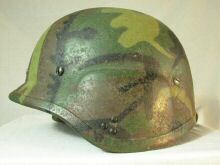 Any ideas, suggestions, references?" 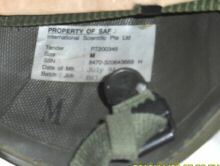 RABINTEX RBH 303 CROWN used by S.A.F. 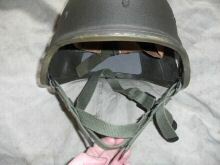 General interior, with chinstrap fastener and plastic chin-cup. 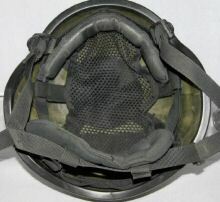 General view of interior, note mesh liner and large neckpad. 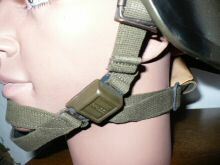 Detail of neckpad from rear. 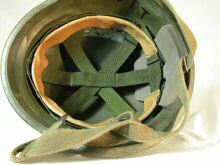 Headband is mostly secured by Velcro - here withdrawn from front to show possibly useless cloth pad beneath mesh. 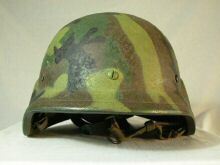 "At the moment there's no real evidence that this is in widespread use by Singapore Armed Forces; all that can said is this helmet was sourced from Singapore and has an identified (labelled) SAF camouflage cover that fits perfectly. 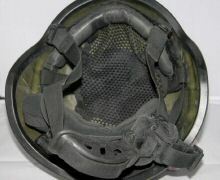 There was a manufacturers and/or users label in the helmet, but it was removed before acquisition." 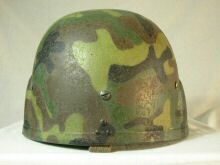 "Resembles current US MICH/ACH types, but with a completely different liner system. 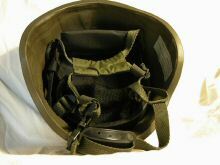 See manufacturers page here. 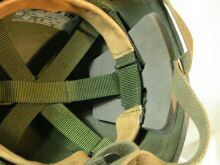 Worth noting that the only clue to identifying the helmet is the letters 'RBH' embossed on both elements of the plastic chinstrap fastener. 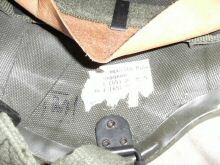 In quite small letters." 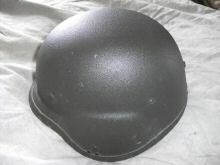 SCHUBERTH 826 - test example. 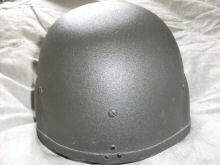 "Schuberth 826 that was made as an offer for Singapore. 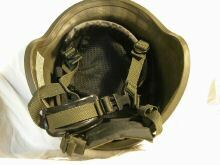 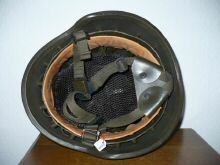 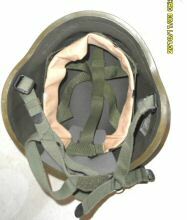 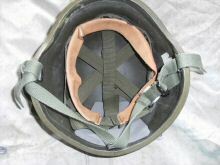 In the neck is a protector made of leather fixed on the straps by two press buttons, similar to the Brunei helmet. 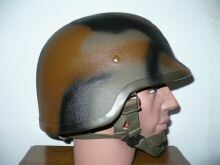 The helmet has a camo paint. 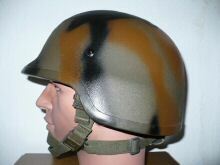 It seems that Singapore asked specially for such a paint. 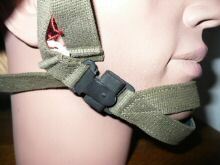 The chin strap show the secured survival buckle."